Home » Events and Blogs » Blog » How Clutter in “That Room” in the House Could be Affecting your Health, Prosperity and Relationships. 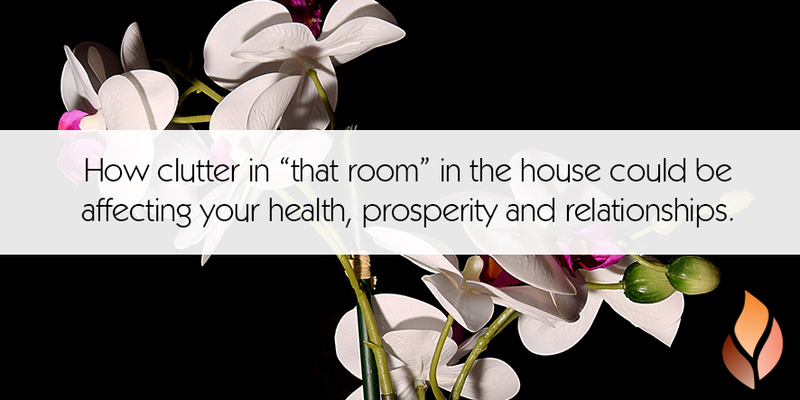 How Clutter in “That Room” in the House Could be Affecting your Health, Prosperity and Relationships. It is pretty general knowledge that clutter obstructs energy flow and therefore makes for less-than-auspicious Feng Shui. Obstructions to energy flow on the physical level, can also have a large and tangible effect on your life. So how does clutter manifest, what effects can it have on your life and how do you fix it? In Feng Shui, every area of the home corresponds to (or represents) an area of your life. Each area is called a “gua”. Restricted energy flow in a certain area of the home, directly translates to the area of your life that that part of the home represents. For example, old, unused or broken items in the Relationship Gua could translate to a run-down, disinteresting or even broken relationship. Boxes piled up in your Prosperity Gua that restrict access to that room and inhibit energy flow in that area of the home may be restricting the flow of money to the household (and to you!). A storage closet in your Health Gua that never gets cleaned out could be a cause of any health issues you or your family may have experienced while living in that space. That is why decluttering is so essential. So, how does clutter manifest and how can I fix it? Sometimes there is one specific area of the home that seems to get untidy or dirty faster than any other area of the home. This can indicate a part of the home where energy is stagnant and gathering in one place, rather than flowing through the entire space. It may be that the energy has nowhere to go – is it at the end of a corridor or hallway? Is it at the back of the house? Is it a room with no windows where the door is always shut? Often energy can also get stuck in corners of rooms; dead bugs or spider webs in these areas can indicate where there is a lack of energy flow. In a room such as this, open up windows where possible, play with lighting in this area. Turn the light on for 10 minutes every day, open the doors and windows; allow new energy to flow through. Play music in this room or bring sound into the space. Place an essential oil diffuser in this area or spray the space with eucalyptus oil or essential oils mixed with water. What is happening in the space? Is it clear or are there objects that block access to parts of the room? Is there a blown light globe or a lamp that doesn’t work? If it is the end of a hallway place a mirror on the wall, which will act as a window and give the energy somewhere to go. Open the space up as much as possible. It may be worth putting a bright coloured rug in that area or some plants to bring in new and fresh energy. Enliven the space. Do whatever you feel will increase the energy flow in this area. Additionally, I often find that in homes there is one room – “that room” – where clutter is usually abundant. Often “that room” is not used and the door remains closed. It’s not that there is anything particularly wrong with this room, it’s just the one room in the house that isn’t used as frequently as the others. Often in this room, we find items that are also not being used, or which don’t have a proper “home” within the house, or even which are broken and in need of repair. Sometimes we find items that have just been put in this room with the intention of finding them a “home” at a later time, but time escapes us, or we just never find a place where they belong. I have been into houses where “that room” has been in the Prosperity Gua of the home and the client has been complaining about money issues and income being stagnant. As soon as they become aware that “that room” is in the Prosperity Gua the lightbulb comes on and I often hear comments like “ohhhh that explains a lot” or “wow, that makes sense”. Commonly, “that room” is a garage or a spare bedroom or a study, however I have also seen “that room” as a home office when clients have hired me to help with their careers. “That room” and the stuff in it can represent things in our lives that perhaps we do not want to deal with or that we don’t want to look at. It can also be things that we have put on the back burner, or things that we will deal with “later” because we “don’t have time” or “aren’t in the mood” to deal with that right at this moment. It’s possible that this is an area where energy is stagnant, so again, add light, add natural air flow if possible (not just air-conditioning or a fan), cleanse the space with essential oils and sound. Spend time in this room, bring your own energy into it. Identify which gua “that room” is in and apply remedies and power tools to enhance the energy in that space and that area of your life. 1. What was your original intention for this room? 2. What did you originally intend it to be? Is it that way now? Is it the inspiration room you wanted? The media room you imagined? Is it your sanctuary or yoga room as you had originally planned? 5. What kind of objects are in this room? How often do you use the items in this room or area? Are there any that may be obstructing energy flow? Are there any you could relocate? Can you walk through the room easily and access all corners of the room? Or are some blocked by boxes or maybe even unused gym equipment? If you can’t get into the room or access every space within the room then neither can the energy. I know, I get it. We all have some form of clutter, myself included and sometimes the space we have to make do with just simply isn’t big enough. I have also had “that room” in my own home, but the key is to just manage it, stay on top of it. Don’t let the clutter get out of control. As much as you can, store loose items in tubs or boxes and store these as neatly as possible. Vacuum the room when you can and keep as much space in the room as possible. Every few months move some boxes to a different part of the room and move items around. This will get the energy moving in there. In any home or space, there will be areas where energy flows freely and easily, meandering through the home and there will also be areas where it can slow down get stuck. The key is to identify these places, often where clutter or dirt continuously builds up, or sometimes in “that room”, then to manage them. Bring energy in, keep energy moving, just for 10 minutes a day, or at the very least once a week. Add sound, light, air, scents and clear the space as much as possible. Pack things neatly and give them a place – even if that place is a box! Get your life energy moving, enhance those areas of your life that have perhaps been stagnant and Feng Shui Your Way to a home and a life free of clutter!